Positive and Negative Space MLK and I Have a Dream wall. Love! Happy Black History Month Everyone! 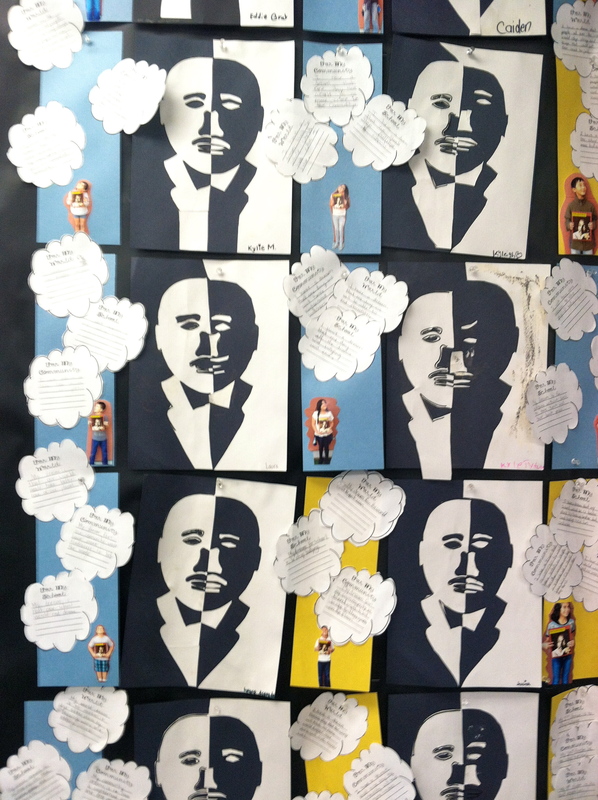 This post is to share the wonderful and easy project my students do for Dr. Martin Luther King Jr. Day. I found this awesome post while searching Pinterest (Follow me!) one day. Awesome post with template included! My only tip is to make a sample prior to the lesson. 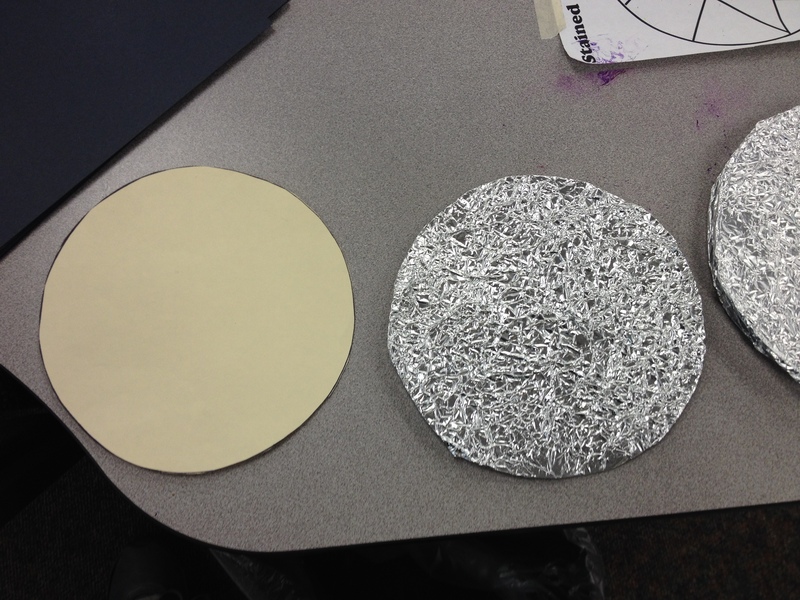 Sometimes I think I can model an art project for the first time in front of the class, but not this one. This one has a couple of tricky areas so be sure to complete it first so you’ll better be able to help your students. They need to follow these directions exactly. I think the end products are so cool, even the ones that were done “wrong”. 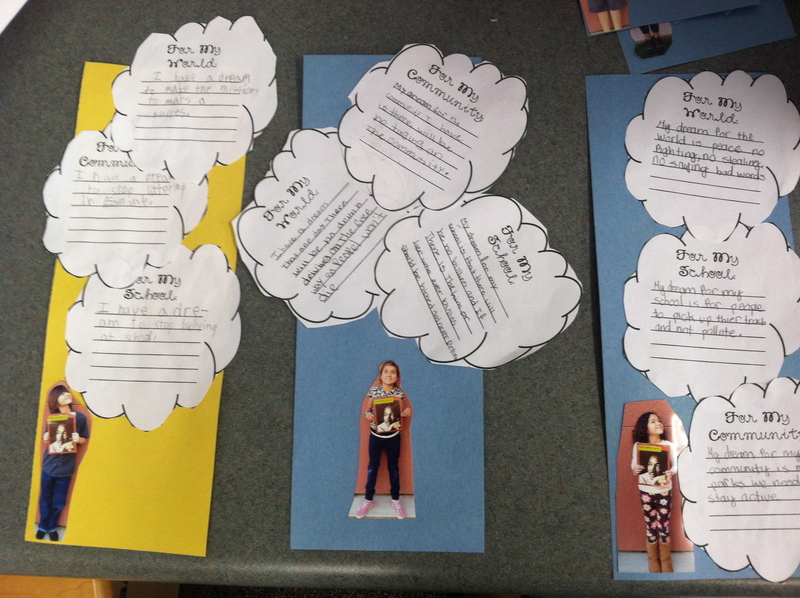 The other project is the “I Have a Dream” picture project. I basically run off copies of three thought bubbles. 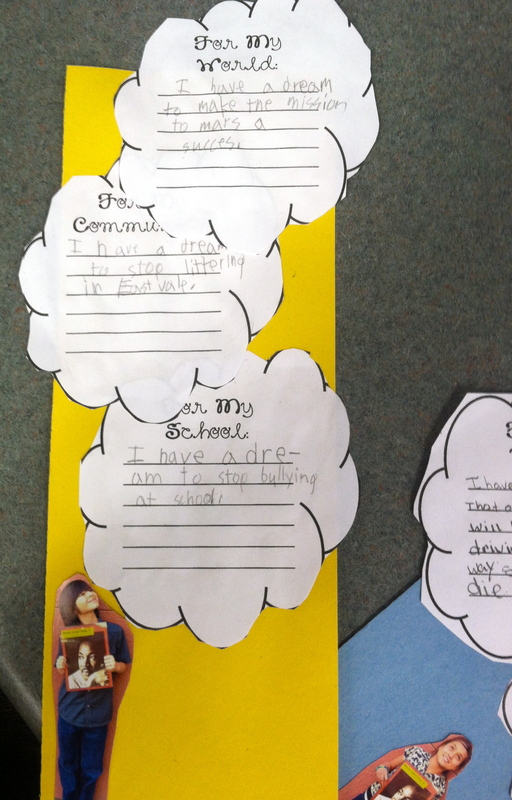 One bubble says…”For my school”, the other says…”For my community”, and the last bubble says…”For my world”. After we have a discussion and brainstorm some quality ideas, the students write their dreams on a piece of paper. Once I look that over and proofread it, they get permission to write on the thought bubbles (final draft). A couple days before we complete and assemble this project, I take a picture of each student holding a MLK picture looking up to the sky. I know! It’s so cheesy, but they turn out hilarious. I think the kids secretly like when I do these cheesy photo projects, at least that’s what I tell myself. 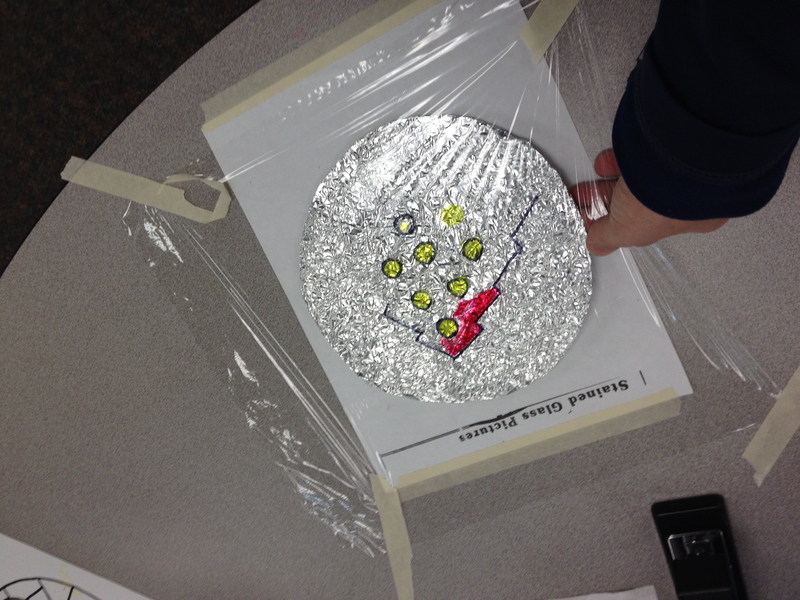 Once the pictures are developed, the students assemble them quickly and “Voila!”, an awesome project is complete. 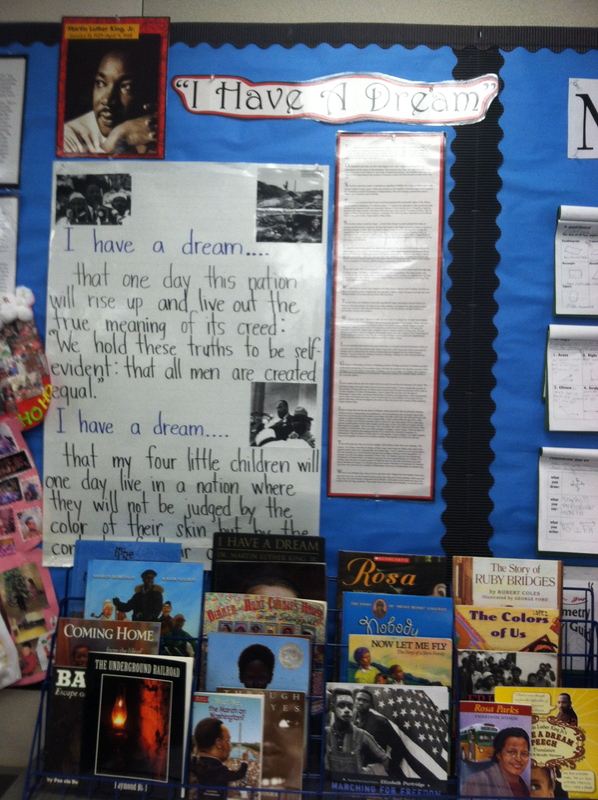 Finally, my students all memorized a portion of Dr. Martin Luther King’s famous speech. I was a little nervous with the complexity of the speech, but my students killed it! Truly a job well done for all of them–so impressed. After all the students finished, we watched the actual footage from The March on Washington. The kids were so into it, and saying the words right along with Dr. King! 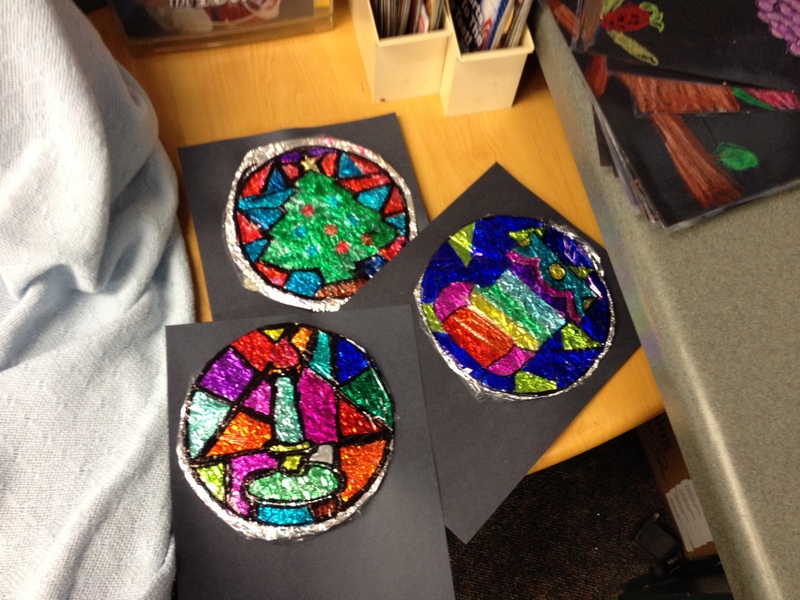 Some finished stained glass projects! Love. When I was teaching first grade, a very amazing teacher introduced me to this craft and I’ve done it every year since. The results are always the same. 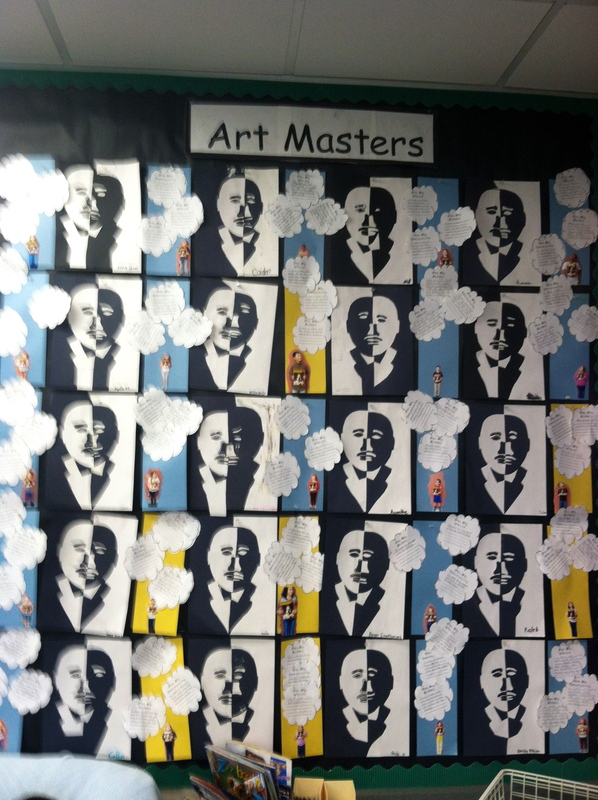 The artwork looks great and the kids LOVE doing it, regardless of their age. We usually do this during the holiday season, so that is why the pictures you will see are Christmas-y. 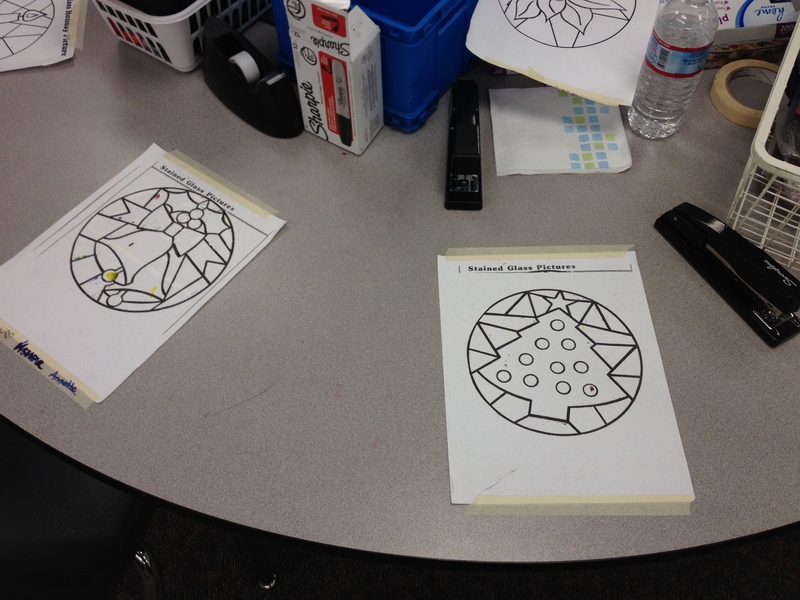 You could run copies of any stained glass design to fit your needs. I just like my Christmas pics. Ideally, I try to pair this assignment with an informational text article explaining stained glass windows, i.e. the history of it, the technique, most renowned pieces, etc. I also have a short poem titled “Stained Glass” that the students memorize for an oral presentation. Now, notice I said ideally….this year, I simply ran out of time. I ended up completing this activity during our holiday party. It actually worked out well, but it was purely for the fun of it–no text needed. 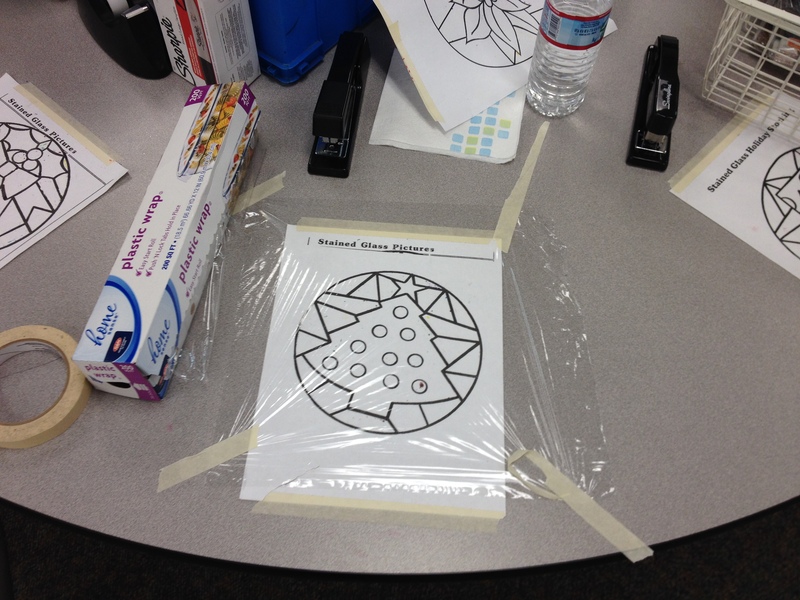 First, create a circular template to fit your stained glass design. 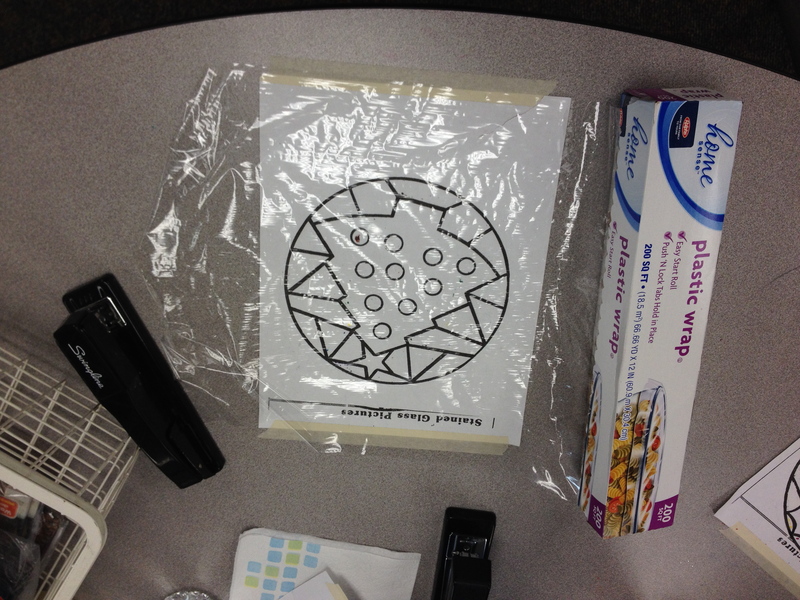 Trace circles onto a file folder to cut out. Do not use regular paper–too flimsy! Tape your templates on your work space. These will remain for each student rotation. Only the clear wrap gets moved. 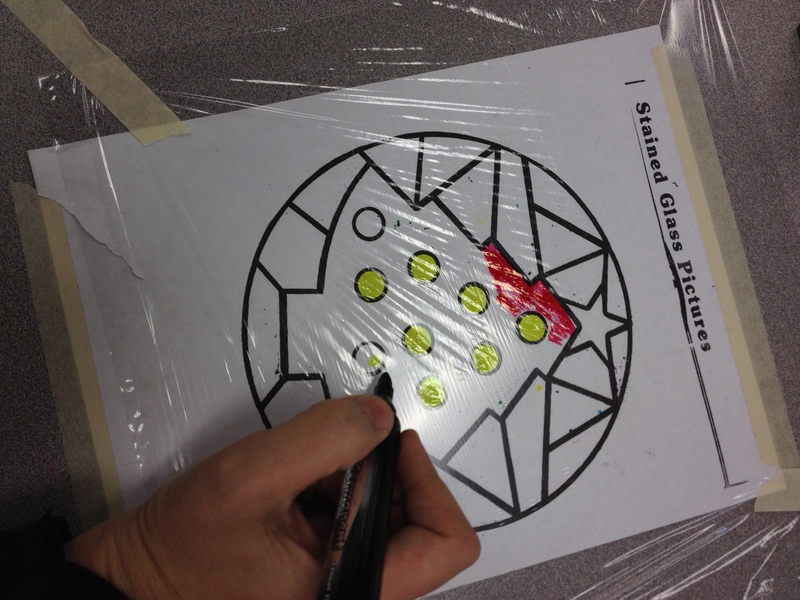 Cover the picture with clear plastic wrap. This is what the students will be coloring on. Tape clear plastic wrap tightly and securely over each picture. Make sure the students don’t move it around. 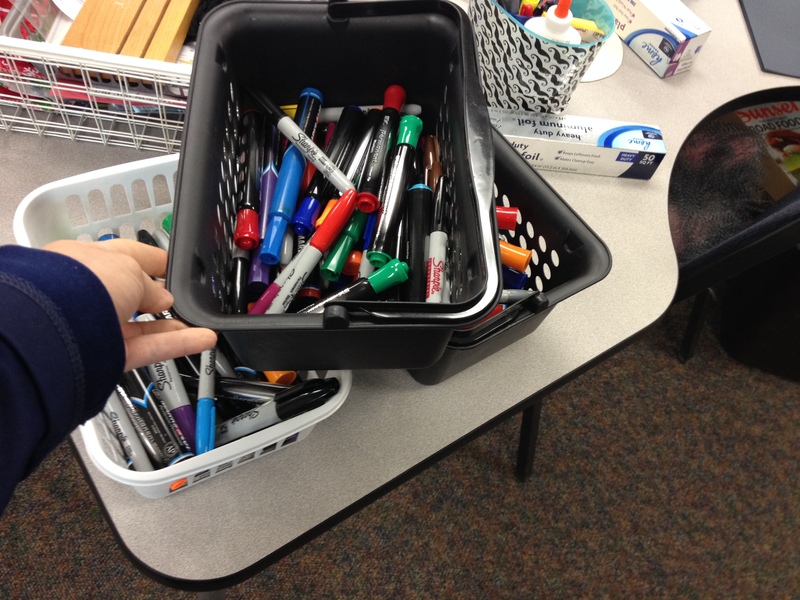 Sharpies and Marks-a-lot markers work the best! They must be permanent. Color gently and make sure every spot gets colored well. 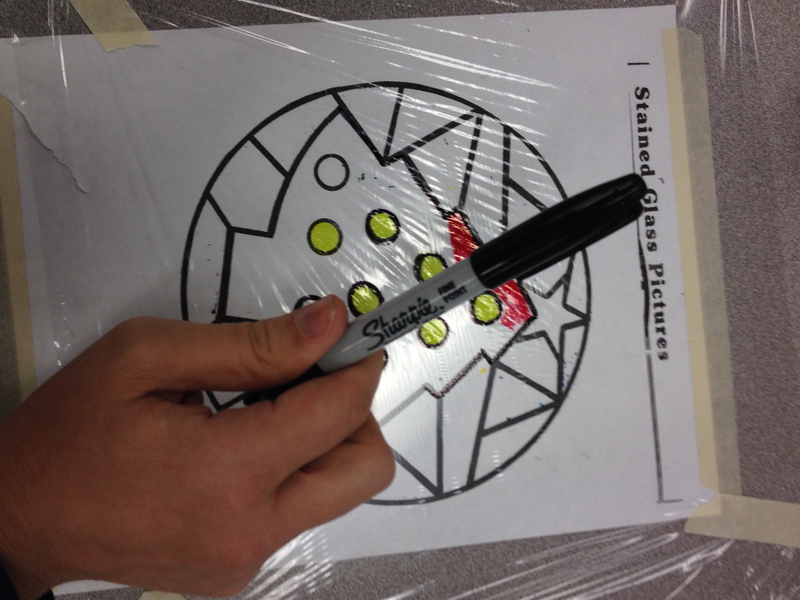 After the picture is completely colored, the students MUST outline ALL the lines of picture in BLACK marker. This is what makes it pop! 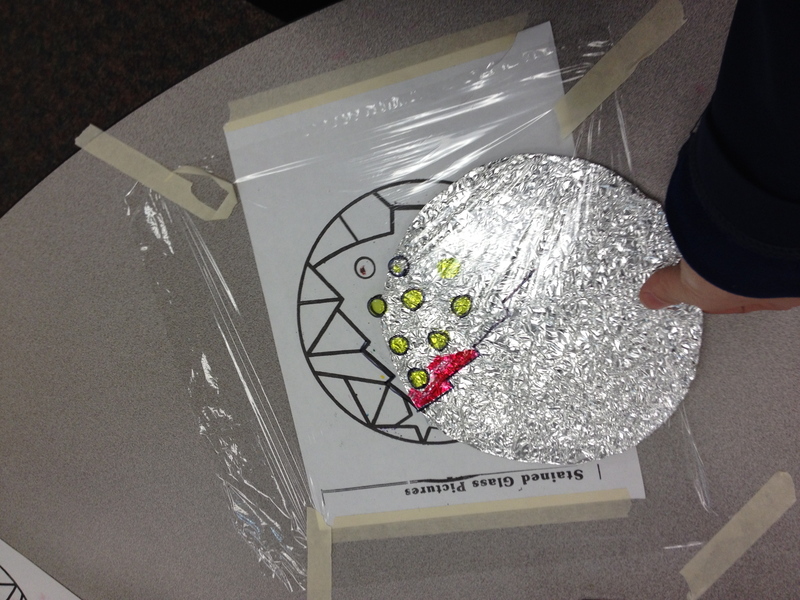 Carefully slide the file folder that you wrapped with aluminum foil under the finished picture. 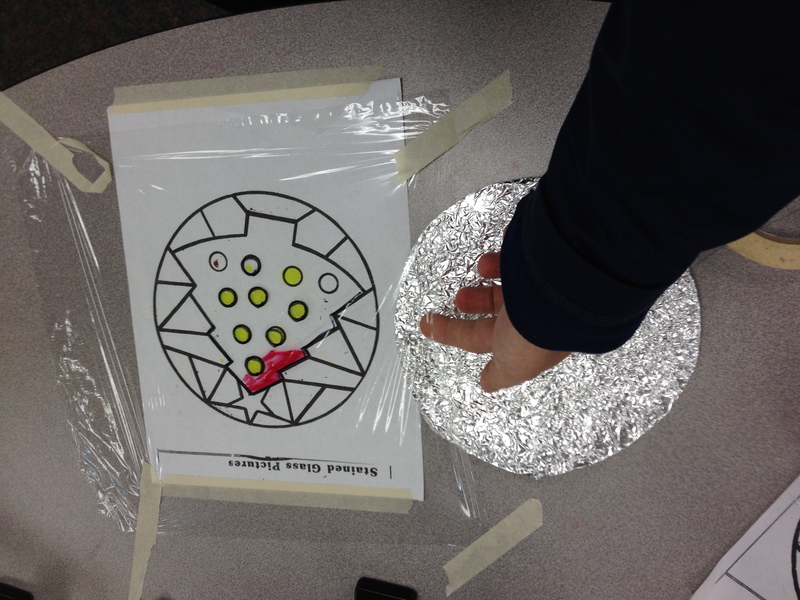 *Important- to wrap the file folder in foil, you must first crumble it into a ball and then gently unwrap it. Be careful because it tears easily. This is what gives the window the desired look.